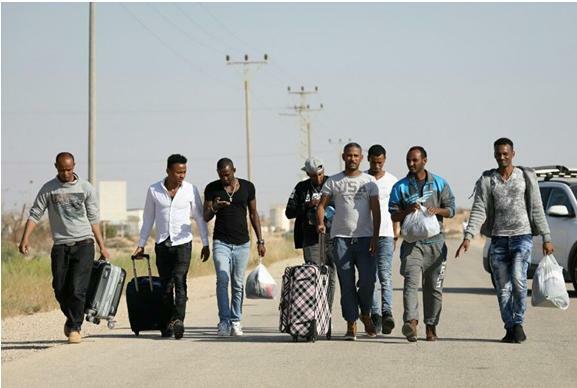 Israel has released from the Negev’s Saharonim Prison the last of approximately 200 jailed African asylum seekers, the Interior Ministry announced on Sunday, April 15. This came following the failure of the government to reach any final deal for deporting them along with thousands of other Eritrean and Sudanese men. The far right government has been trying to finalize an agreement with Uganda to take in the refugees who, over the past decade, entered Israel on foot by crossing the Egyptian border. Most of the 200 men set for release were sent to a desert prison in recent months to await deportation to Uganda. Israel’s Supreme Court, however, has issued temporary injunctions to give more time for petitioners to argue against the deportation plan. On Tuesday, April 10, government representatives told the court that an envoy was in an African country finalizing a deportation deal after an arrangement with Rwanda fell through. However, Israel’s Channel 10 news reported last Friday that an Israeli emissary dispatched to the country has thus far failed to persuade the Ugandan authorities to sign off on a previous verbal agreement to take in a large number of migrant deportees. Earlier this month, 58 refugees were freed from the Saharonim Prison after a similar reported deal with Rwanda fell through. Rwanda, another “third-party country” that had reportedly agreed to accept asylum seekers from Israel, has also denied the existence of any deal and said it will not absorb any migrants expelled from Israel. The developments came after Prime Minister Benjamin Netanyahu announced earlier this month, and then only hours later canceled, a new agreement with the UN’s refugee agency that would have seen some 16,000 African migrants resettled in Western nations and a similar number given temporary status in Israel. The prime minister froze the deal shortly after announcing it, following an outcry from right-wing politicians. Several human rights organizations — The Hotline for Refugees and Migrants, ASSAF –Aid Organization for Refugees and Asylum Seekers in Israel, Physicians For Human Rights, Worker’s Hotline, The Association for Civil Rights in Israel, and the African Refugee Development Center — called on the government in a joint statement to find “real solutions” for the African asylum seekers. “The dangerous plan to expel refugees to Uganda and Rwanda is falling apart, and the refugees who were imprisoned despite committing no crime will be released from prison, but the government continues making cynical use of the asylum seekers and promoting anti-democratic bill proposals, while completely shirking off its obligation to rehabilitate the neighborhoods of south Tel Aviv,” the statement charged.